The purpose of the School for Formal Bookbinding is to provide high quality instruction in hand bookbinding within the context of the German academic tradition that I learned from my teachers, Trudi and Fritz Eberhardt. Emphasis is placed on the understanding that a successful hand-bound book is the result of interrelated decisions about structure, technique and material at every stage of the binding process. The school is located in Northeast Pennsylvania between Wilkes-Barre and Scranton and is equidistant from New York City and Philadelphia. For 2019, the school will offer the progressive series of one week classes (Bookbinding 1 through 6) twice. In the case of classes scheduled in sequential weeks students who sign up for both classes can do so at a reduced tuition and housing rate. Anyone with specific interests or ideas for classes not listed is encouraged to contact us. In early 2014 the School was the recipient of a bequest from the estate of the late Elke Shihadeh. Wife of Philadelphia area bookbinder Fred Shihadeh, Elke was herself an accomplished binder and conservator. 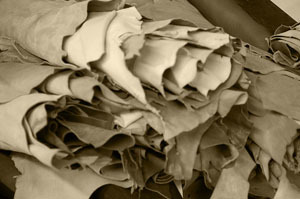 Her wish was that the remaining leather and paper in her shop would be donated to a school. As a result, students here will have access to a wide range of leathers and papers for their projects. We are extremely grateful for this generous gift. All classes have a maximum of three participants and a minimum of 1. Tuition is $240 for two-day classes; $600 for five-day classes; $960 for two sequential five-day classes. Material fees are listed with each class. A deposit is requested to hold a place in a workshop: $50 for a weekend, $100 for longer classes. Deposits should be received, at the latest, two weeks before the class runs. We will also need to know whether housing is needed. Fees are payable by check, Mastercard, Visa, Discover or American Express. We can offer housing for three students on a first come first served basis at 35 Powell St., a three bedroom house just around the corner from the school . The house is furnished, with a fully equipped shared kitchen and a shared bath. The cost is $70 for two-day classes, $175 for five-day classes; $350 for sequential five-day classes and the intervening weekend.. Please be aware that the school is home to two very friendly rescued cats. The house at 35 Powell St. is animal free. If you have any concerns please contact us.